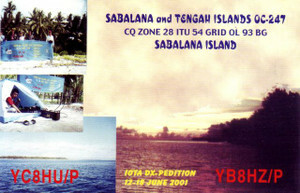 I tried to gather the donation for OC-208 Bangai Island for another stations from last Saturday. I am informing this info on IOTA-chasers Forum and my Blog. But none sent me another donations. I am very very sorry. 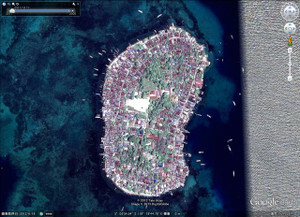 Please decide to go to Banggai Island or not from you. If you decide NO, I return those donations to them. And I will try to propose to another YB8 stations for OC-208 plan. But if you can, I will send you our Japanese friends donations. Thanks for your reading. John-san. Shu san, domou arigatou gozaimasu. Cotto propogation wa youwai desu. Yotei wa doyoubi yoru made. Nichi youbi 10.00 ji kaeru yotei desu. Kyo to asita made gambarimasu. Ima made 850 qso on phone to 650 qso on cw. Hokano mondai wa dengki no koto, genset tsukau toki wa kekko qrm takakute, yoru wa kekko yoku nasimasu. > Ram-san, Thanks. Thank you very much desu. > Kinishinaide kudasai. North America no minasanga taihen yorokonde imasu. > Taihendeshouga North America wo sagashite saabisu kudasai. small HF transceiver 100 watt, such as IC-706. 2m band and UHF are not necessary. An old and 2nd trx is good enough, the low prize is much priority. I need a small transceiver since my current is too big to bring to island. I got a special call from Kadek yesterday. after getting well in health. Shu san, email itadaki arigatou gozaimasu. Youtei wa 7-10-14-18-21-28 Mc ssb-cw-rtty yaru tsumori desu. Antena wa 5band hexbeam, 7Mc antena dipole desu. 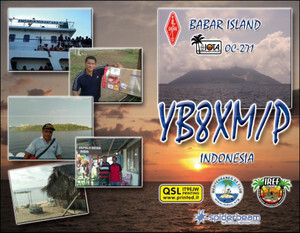 Qsl card via yb8bri, as on qrz.com. Anounsa wa yarimashita, yoroshiku onengai simasu. Shu san, 26nichi iku yotei desu. Makassar asa kara kuruma de Pangkep Futoo e iku, 2jikan kakarimasu. Tsugi wa fune de mata 2 jikan kakari, tabun hiru ni narimasu. Hiru gohan owattara, antena o setting shite, dekimashitara yoru ni cq tesuto nombiri yarimasu haha. Mondaiwa dengki no kotodesuga, 18.00-24.00 sika arimasen. Nokori jikan wa gen-set to solar cell de tsukaimasu. Email wa dekiru toomoimasu. Watashi ga ipad to internet computaa motte ikimasu. 30-31nichi WPX contest mo sangka suru tsumori desu. This is my plan how do you think Shu san. 諦めていたQSL Cardが戻って来ています。 いつもお世話になっている、山本さんに情　報としてお知らせします。 どぉ～思いますか　? GE Shu San I get trouble on the equipment here...can't use the trx because 5 year he (my friend) didn't use it so may be any trouble on it and I must bring the trx to Palu or Jakarta for repir...would you qsp to all friend there about this trouble I hope after Banggai I will go back to Togian again...phone no Internet conection so it's a big problem for me to contact with you. I'm vy sorry for this case. and tried to operate QRV over there, unfortunately has transceiver Issue, no power output so he can’t operate accordingly as promised, and said very sorry caused inconvenience. Regarding NA-161 : I am in contact with KL7XK an I think he will be QRV from Pleasant Island again . His QTH is very close to that island and he has his own transportation , the same small boat we used to travel to the island during our activation in Aug/2012 . 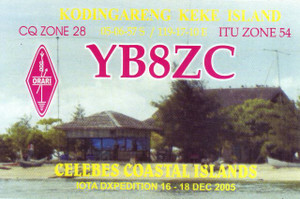 You can see OC-245 Breueh Island QRV information. Please be understand with limitation of regulation, operation area, electric, operation time and operator, we are focusing only on SSB only 15m, 20m and 40m. Other mode and bands are exceptional. Breueh Island 2013 We moved to second area (Lighthouse) with only 2 days permit only, to answer request from JA and NA. Shuji Yamamoto Thanks, Adhi-san. I will be QSP to my friends. I received MSG from my friend VE7DP Frank. "I have OC-245 confirmed , but other VE/W stations are still trying for QSO . 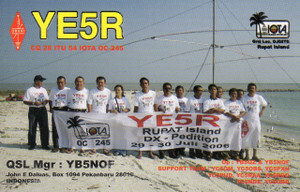 If you hear YB3MM/6 or YF1AR/6 please ask for QRV on 40 meter at 14 -15 UTC and also 20 metrs at 15:30- 16:30 UTC - most of the time they are on 15 m , but no copy here in VE7 . GM John-san, Thanks for the nice information. Do you have new license or yourself callsign in April? I must correct callsign for GDXF and IREF. Please send me any information for OC-208 project. On technical meeting to day, we will get the call sign, I suggest the call is YE8P...for Central Celebes they have 4 one digit letter used for special activity etc M N O and P so what's letter you think better for our OC-208...Shu san ??? This is my personal opinion. All YE8 callsign are GOOD! OM Shu...now I have been in Palu and tomorrow morning we will make a technical meeting with ORARI CENTRAL of CELEBES after then we going to Banggai Isl for checking the location we will use. I will give my report after then. More than 14 stations from JA has make QSO with YB6N and already in log. Many station of JA is good operator and they do not make QRM, long YB6N activities and I like JA HAMs spirit. For the next I will be QRV again to others island. All ok om Shu san...we thank's for all participate on our pedition...and I will try to do the best...this activity have I do long time ago alone or with group, if posible I will do it from all rare island in my country hi hi just in my dreamed. 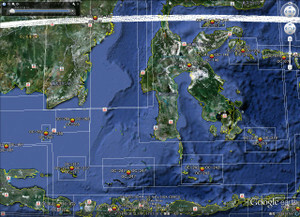 Before I go to Sarasan or Tambelan we must stop in Ranai Natuna Besa OC 106, waiting our boat go to Sarasan South Natuna...if I have chance I will on the air special for Japanish station who's no wkd with this island...just for killing time hi hi may be for 6 hour...I think it's enough for 100 stn by the way it's not my schedule according to dxpedition. Thank you for the information on Kadek. Congratulations on your Nusantara　Award. Shu, I send small donation to help John with his expeditions. Also sent　some to Imam. Mario Borstel様からのメッセージ: Hi Shu, here the donation for John YB5NOF and his OC-208 mission. IOTA trip you e-mailed me about. Good Luck and Good DX. 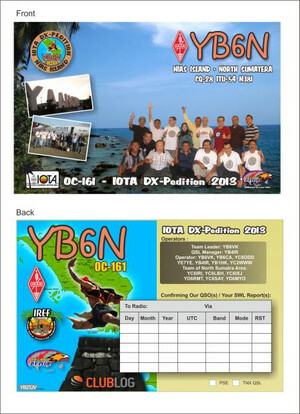 I sent you $15 for the YB IOTA trip support by YB5NOF and YB5QZ. Here's a donation for the YE8B operation. I also need OC109 and OC122. Yes, we consider to move our location to take more distance from the hill in north-east side of current location. Very sorry. Until this time we could not get landing permit to Rondo Island from the authority. 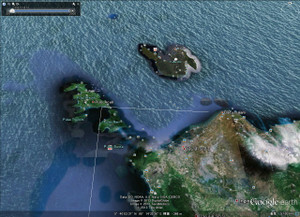 Therefore, we switched to Breueh Island OC-245, which do not need special landing permit. Do you know DX world news? Please see this website. MM0NDX Col is the editor of DX World. He sent me your donation as DX World for 3,500yen(about 38USD). His message to you. Please use the DX World logo on the QSL card. I think it's great news. Click on Slide show and adjust time in seconds or step through manually using arrows. I go to Palu 14/03/2013 for final checking direct to Banggai, technical meeting with ORARI team in Palu and process the recomend for our license, after there back to Jakarta for process the license from ORARI HEAD QUARTER. 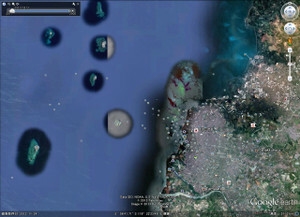 To day I have been in Jakarta and this morning I go to ORARI HEAD QUARTER. 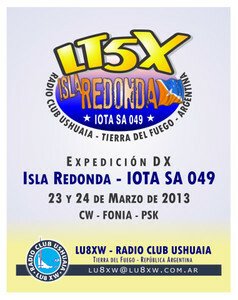 This is my activity for IOTA and the next OC 208, 109 and 122...and the other island. Many thanks!! I understand for your hard QSL managements very well. I made a list for YB5NOF QSLing. date when we will announce it. but we have problems,but I DREAM DREAM AND DREAM. 73 my friend in Japan Shu-san your friend in Russia Sergey-san.